This week, as my exclusive interview with Temptation host Ed Phillips continues, I ask Ed about some of the habits of the good contestants on the show, and some of the habits of the bad ones… and we also discover a bit more about Ed’s hosting techniques. But this section of the interview begins with my asking about that thorny subject of Stage Fright…. SH: On Temptation, how often did you see contestants’ nerves get the better of them? EP: There was a lovely guy I used to see in a coffee shop in Bondi Junction, and he was a barrista. He was always lovely, and said “I’m gonna go on the show, I’m gonna go on the show”. He told me this for about 4 months. Finally, he turned up and went on it, because he said “all my friends say I’m so smart”. He wound up getting minus 15. He started on 20, and he wound up getting a negative score – the worst score we ever had – and he was so crushed and deflated, the poor dude. EP: He didn’t charge me for my coffee the next time I saw him, and he got an absolute belting from his mates. He was one guy who was just a bubbly, lovely, confident fellow and just capitulated. SH: Oh that’s terrible. Did any contestants have any good tricks for dealing with nerves that they revealed to you? 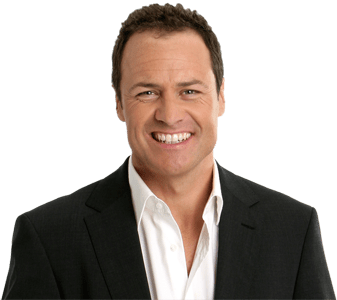 EP: We used to have sportsmen’s ‘Battle of the Footy Codes’, etcetera, and some Celeb challenges and those guys were quite unruffled. I don’t know if it’s just a matter of practise of being on the sporting field under more intense pressure or the celebs having been under the lights. For people who just apply, for many of them it’s the first time they have ever been in front of a camera, we had lights, and audience and all that sort of thing so they felt it much worse. I used to notice some of the better players would just find a moment to themselves sitting behind the desk because it was their second, third or fourth night. They would shut their eyes, they would go into a little trance, and they would find some quiet time just to shut all that out. People had some mental relaxation exercises to take them to a happy place seemed to go a bit better, in amongst the chaos of us doing sound checks, audience clapping. I think if you could tune out all the stuff that didn’t help, you did a lot better. And that’s probably why the sportsmen were good, and the celebs, and the better players. SH: That’s interesting. And were there ever any big meltdowns? EP: I remember one guy arguing for ages – he was wanting another cushion because he switched chairs from being a challenger over to the champ’s chair – saying, “I’m not at my optimal playing height”. Are you kidding? I was like “fine, okay, we’ll get you another cushion”. SH: “Optimal playing height”? That’s a new one. As a host, how did you put contestants at ease? EP: Look, I felt for each competitor, in the moment, and what they were going through. I would just say to them – knowing that for most of them it was their first time on TV – a little hello and “here’s what we’re going to do. Hey, you’re into parachuting I see on your application, I’m going to ask you about your last jump or favourite jump, ask you about your kids”… and for many of them, the hardest question they had to answer on the night was the first little couple of hello questions, because they had to remember something or give an answer that wasn’t just a fact. SH: Yeah, that’s true, it’s a different mode of question and answer. EP: We had guys who’d been shot. We had people who had kids that they wanted to talk about, all that sort of thing. They were more nervous about that than actually getting a couple of the points on the board when the game was on. It was a real ice breaker, and from there on, just not overloading them with too much if they got to walk through the Gift Shop and have a bit of fun. We thought – because we did so many hundreds of shows – that it wasn’t a big deal, but for them it was a really big deal because it was their one show.